Vegetable oil obtained by pressing dried flesh (copra), rich in saturated fatty acids (mainly auric acid), vitamin E and K, minerals and polyphenols.Easy to apply,since oily above 23°C, and solid at lower temperatures.The consistency is similar to white butter.Prodigious and multifunctional, this oil has infinite virtues and applications.For skin: due to its small molecular structure, it gets easily absorbed, and while noun-oily, it makes your skin very soft.Tanning, soothing and emollient effects; it protects against salt sunlight,again, and dryness, and il prevents the appearance of aging marks. It makes your skin elastic, silky, and smooth.Its protective a action is ideal for preventing lips cracking. Excellent for face and eyes cleansing and make-up removal. For Hair: when used as a pack treatment, it is miraculous against dandruff. It is restructuring, highly protective and antioxidants. It protects against salt and makes exhausted and shaggy hair smooth, full-bodied and healthy, while giving it body and shine. Almond oil, rich in unsaturated fatty acids, Vitamin E and Vitamin A, is well-tolerated by even the most sensitive skin types, due to its close affinity with the composition of the skin's sebum. It has emollient, soothing, nourishing and elasticity improving properties. 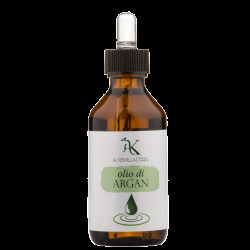 Thanks to its high content in essential fatty acids and vitamin E, Argan oil protects the epidermis from aggressive external factors, neutralizes harmful free radicals and ensures the skin is provided with moisture and lipids. Rich in vitamins, oleic acid, omega-6 and unsaponifiable fractions. Avocado oil penetrates the skin easily, where it has a regenerative, nourishing and protective effect, making an efficient contribution to the reinstatement of natural softness and skin moisture. Rich in fatty acids and tocopherols that have a close affinity with skin sebum, wheat germ oil is characterized by skin-balancing, restorative, antioxidant and elasticity improving properties, which make it particularly indicated in the treatment of dry, fragile, sensitive, mature and slack skin. Sunflower oil contains high percentages of linoleic and oleic acid as well as vitamin E. It is easily absorbed by the skin. It moisturizes, refreshes and has an effective antioxidant action, protecting the skin's tissues from premature ageing. Jojoba oil is a liquid wax rich in antioxidant tocoferols; it is very effective in restoring the skin's lipid barrier when lacking in dry and hypolipidic skin, ensuring an indirect moisturizing effect as well as an excellent non-clogging emollient effect. Rich in essential fatty acids (3 and 6), Linseed oil has remarkable moisturizing, restorative and rebuilding properties for skin and hair, making it useful in treatments designed to counteract dryness, irritation, redness and cracking. Rich in palmitoleic acid, Macadamia oil has remarkable restorative, nourishing, moisturizing and softening properties. It is characterized by it excellent smoothness and lack of oiliness to the touch and rapid absorption. Rich in unsaturated fatty acids and tocopherols, hazelnut oil easily penetrates into the epidermis. It leaves no greasy residues, is perfect for sensitive and irritated skin and also for mixed and oily skin types, where it has a sebum balancing and astringent effect. Very light, non-greasy and easy to absorb. Apricot oil has emollient and nourishing properties that help maintain skin's moisture and elasticity. Characterized by its high content of ricinoleic acid, castor oil is widely used in cosmetics as a nutrient and softening agent for the skin, and for its strengthening, restorative and softening properties for the eyelashes, hair and nails. Made up of a high percentage of polyunsaturated fatty acids and characterized by a significant unsaponifiable fraction rich in sterols and gamma oryzanol. Rice oil is prized for its emollient, moisturizing, protective and antioxidant action. Rich in unsaturated essential fatty acids, trans retinoic acid and polyphenols, Rosa mosqueta oil is particularly active in preventing the premature ageing of skin tissue. 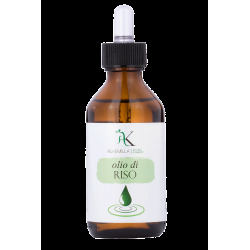 It lessens the effects of scarring and stretch marks and has an emollient and restorative action on dry and dehydrated skin. Made up of unsaturated and polyunsaturated triglycerides and an unsaponifiable fraction rich in antioxidants. Sesame oil is useful in the treatment of dryness, irritation, fragility and lack of skin tone; it has good shelf life and is easily absorbed by the skin. Obtained by hydrogenation of the squalene naturally present in the unsaponifiable fraction of olive oil and characterized by its close affinity with the skin, plant-derived squalene prevents dryness and brings elasticity and nourishment to the skin. It leaves the skin with a light, silky and non-greasy touch. Pure grape seed oil, rich in polyunsaturated fatty acids and antioxidant polyphenols; emollient and regenerating, it protects the skin from premature ageing, atmospheric agents and free radicals.